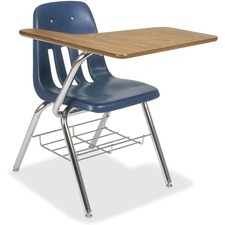 Space-saving 9000 Classic Series chair desks gives you maximum performance with a minimum footprint. A tied-in arm welded to Virco's tubular steel back support delivers added strength. This model has a high-pressure laminate top and a steel-rod bookrack.